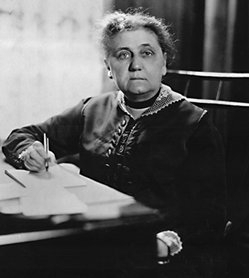 Jane Addams—pioneer social worker, feminist, and internationalist—represented the peace movement in the United States. She was awarded the peace prize in 1931. In 1889, Addams opened Hull House, an institution dedicated to improving the lives of Chicago’s working poor. Two thousand people a week used its services, which included kindergarten and adult classes, a public kitchen, swimming pool, circulating library, employment bureau, gym-nasium, art studio, and music school. Addams was a member of the Board of Education, president of the National Conference of Charities and Corrections and held various other civic posts. In 1910, she received the first honorary doctoral degree awarded to a woman by Yale University. 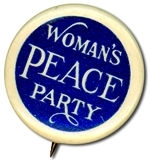 Aspiring to rid the world of war, Addams spoke, taught, and published on peace in America and abroad, accepting in 1915 the chair of the Woman’s Peace Party and later that year the presidency of the International Congress of Women, which met at The Hague. It included 1,100 women from 11 countries, whose mission was to formulate a plan for ending World War I. The congress called for a scientific commission of experts from neutral countries, appointed by their governments, to act as a perpetual court of mediation, continually offering proposals to the belligerents without assigning war guilt. Addams headed a delegation from the congress to approach the foreign ministers of each of the belligerents to offer the women’s proposal for ending the war. Despite their efforts, the war continued for three more years. In contrast to the general collapse of the various peace societies in Europe after the war, the Women’s International League for Peace and Freedom—organized in Zurich, Switzerland, in 1919, as an outgrowth of the 1915 International Congress of Women—flourished. Addams was elected its president. The league denounced the terms of the Treaty of Paris, which had ended the war; condemned the League of Nations for not being sufficiently strong and universal; but could not achieve a consensus on the use of violence in the struggle for justice. The league has continued to fight for peace and freedom; its current activities can be viewed on the web at www.wilpf.org. Special to the Hoover Digest. This article is based on an exhibit at the Hoover Institution entitled To Benefit Mankind: Celebrating the Centennial of the Nobel Prize, 1901–2001, which will remain on display in the Herbert Hoover Memorial Exhibit Pavilion through July 28. Peace prize historian Irwin Abrams’s papers in the Hoover Institution Archives supplied many of the quotes and information relating to Nobel and von Suttner. Return to To Benefit Mankind.